Yesterday, we shared you a whole gallery of photos featuring the new 2013 toy lines from Hasbro for Marvel, Star Wars, Star Trek, Transformers and G.I. Joe. This morning, ComingSoon.net/SuperHeroHype had a chance to visit the Hasbro showroom and take more pictures. The figures that were most noticeably absent from Hasbro’s press blast yesterday were any toys from Marvel Studio’s upcoming Thor: The Dark World, coming out on November 8. Many of them were available in the showroom for pictures. The new figures on display included three smaller figures of Thor (in his Asgardian leisure garb), Loki in his new costume and a Dark Elf, larger figures of Thor in his battle gear as well as new roleplay toys of Thor’s helmet and his hammer Mjolnir. 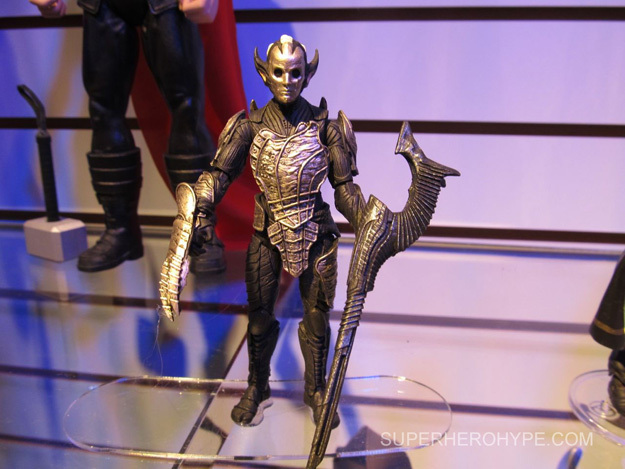 Apparently there will also be a figure for Kurse although Marvel is trying to keep that under wraps a while longer. We still have a lot more to share from our visit to the Hasbro showroom as well as lots more from Toy Fair 2013 proper, which kicked off today. Keep checking back on ComingSoon.net, SuperHeroHype and ShockTillYouDrop.com for regular updates over the next few days. Click here or on the photo below to view the Thor: The Dark World gallery!